NASA’s Earth Radiation Budget Satellite (ERBS) was designed to investigate how energy from the Sun is absorbed and re-radiated by the Earth. Understanding this process helps reveal patterns in Earth’s weather. One of the longest-running spacecraft missions to date, ERBS was launched on October 5, 1984 on the Space Shuttle Challenger and retired on October 14, 2005. The spacecraft was expected to have a two-year operation life, but ultimately, the mission provided scientific data about the Earth’s ozone layer for more than two decades. What’s more, ERBS observations have also been used to determine how human activities such as the use of chlorofluorocarbons (CFCs) and the burning of fossil fuels affect Earth’s radiation balance. 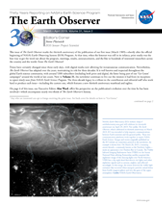 Data on the ozone layer provided by ERBS were key in the international community’s decision-making process during the Montreal Protocol Agreement. This agreement has resulted in a near elimination of CFCs in industrialized countries. It was ERBS data, in part, that led to the understanding that CFCs deplete atmospheric ozone concentrations. The mission was part of NASA’s three satellite Earth Radiation Budget Experiment (ERBE), designed to investigate how energy from the Sun is absorbed and re-emitted by the Earth. This process of absorption and re-radiation is one of the principal drivers of the Earth’s weather patterns. Observations from ERBS are also used to determine the effects of human activities (such as burning fossil fuels and the use of CFCs) and natural occurrences (such as volcanic eruptions) on the Earth’s radiation balance. The ERBS was the first of three ERBE platforms that would eventually carry the ERBE Instruments. In addition to the ERBE scanning and nonscanning instruments, the satellite also carried the Stratospheric Aerosol Gas Experiment (SAGE II). Goddard Space Flight Center built the satellite and it was launched by the Space Shuttle Challenger in 1984. The second ERBE Instrument was aboard the NOAA-9 satellite when it was launched in January of 1985, and the third was aboard the NOAA-10 satellite when it was launched in October of 1986. Although the scanning instruments on board all three ERBE satellites are no longer operational, the nonscanning instruments are all presently functioning.